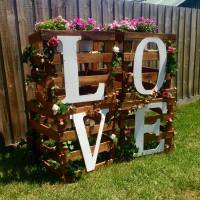 ​ 50% off "LOVE" Letter backdrop hire fees when you book now! Applies to bookings made between 7/01/17 - 28/02/17 when paid upfront. Delivery not included in hire fee, pick-up is available. 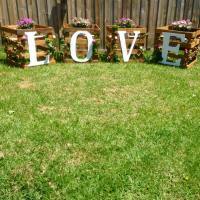 Each letter stands 700mm high (similar to standard table height), can be stacked or laid out as required. Boxes come empty so you can match your own event colours but flowers as shown are avaialble on request. Ask us about our removable table top options. 3. Additional $100 refundable bond must also be paid with all hire. All orders over $300 or long distance hire (60km+) will incur $200 bond. 4. Full payment must be made upon delivery. Payment can be made via EFT prior to hire (minimum 3 business days prior to hire date).